These glittering antique style wedding bands are crafted of 14K white gold and designed to seamlessly integrate with an engagement ring. 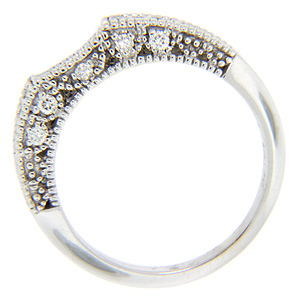 Diamonds are set in the shoulders and on one side of the ring. 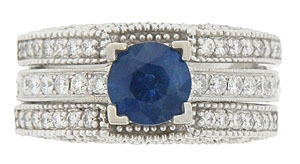 The bands have a cutaway portion meant to cradle an engagement ring. Photographed with R2413-ARO (sold separately). 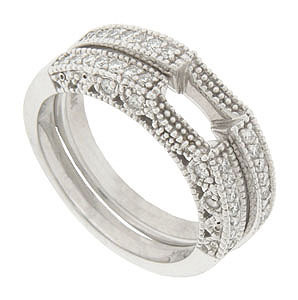 The band measures 3.6mm in width and holds a total of .34 carats of diamonds. Size: 6 3/4. We can re-size or reorder in other sizes. The bands are frequently sold a set for $1,900.